The reason I was struck is that, about fifteen years ago, shortly after we moved to a town in suburban Philadelphia, my older daughter, Elizabeth Yagoda, started to play soccer. When her team practiced, the girls on one side would put loose mesh jerseys–all of the same color–over their shirts. These were referred to as pinnies. Or at least that’s what I thought they were referred to as; the other possibility was some Southern-derived pronunciation of pennies. I had never heard the term before. Current British usage uniformly favors the apron meaning, as in this 2010 quote from The People about the Beckham family: “I can reveal Posh, 36, will be putting her pinny on to cook for the couple’s parents including Dave’s dad Ted, who has previously been shunned from the family’s festivities.” That meaning has not penetrated the U.S. In modern times, the term “pinny” or “pinnie” has taken another meaning in sports wear, namely a double-sided short apron, often made of mesh, used to differentiate teams. This usage is chiefly British, with some usage in Canada and the United States. This type of pinny is also known as a scrimmage vest. 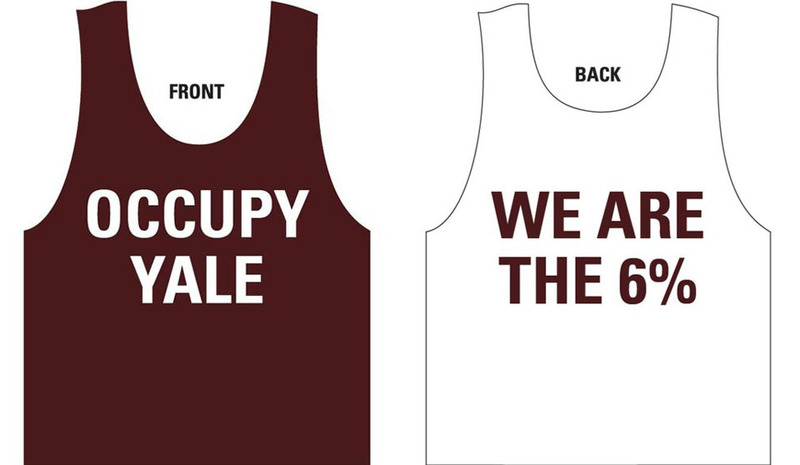 In a clear demonstration that Harvard students measure their “superiority” by their university’s single-digit acceptance rate and their pinnies, a group of Harvard entrepreneurs have launched an “#OccupyYale” pinny — prominently displaying the school’s 6.2% admissions rate — for Cantabs to wear at The Game this weekend. I hadn’t heard “pinny” to denote sportswear until I moved to the US and my son played soccer (football). In the UK pinny = apron, as you’ve said. Presumably it’s related to (derived from?) pinafore, which in the UK is a sleeveless dress worn over a top, which I think is called a jumper here. And in the UK, jumper means sweater. Conclusion: the potential for a transatlantic clothing malfunction is high and we should all be on guard. Red pinnies were carried out onto the Lexington High School field hockey field on cold sleety Massachusetts afternoons in 1949 — but of course it was Englishwomen who brought field hockey and lacrosse to girls/women’s sports in the early 20th C. It’s not surprising that they brought their lingo with them. The garment worn to distinguish between sports teams, especially during training, would probably be called a “tabard”, not too dissimilar from its original use on the battlefield. I’ve not heard of “pinny” being used in this context in the UK. In junior high school in the late 1970’s we used the term “pinny” for the little vest you would put over your gym uniform to differentiate teams. It’s been a long time since I considered the term but I recognized it right away! I checked with my husband, also a Scot (but we now live in the US), and we agreed that a pinny is an apron but we would use ‘bib’ or maybe ‘vest’ in an athletic sense. It would sound very strange to us to use ‘pinny’ in that context. I grew up in the south-east of England and in a sporting sense, they were called ‘bibs’. I grew up with this word in Scotland although I spelt it pinnie – meaning apron. I grew up (in the southeastern U.S.) calling soccer / football scrimmage vests ‘pinnies.’ I don’t know that I’ve ever heard another term used for these mesh vests, and I coached soccer in the U.S. for several years and on several levels. I think it’s important to point out that it is US publishers who insist upon the changes in British English books not the British publishers. Exactly. I have the U.S. version of the Harry Potter series, but haven’t read them. I have the U.K. version of the first installment (which I’ve started), and am looking forward to the rest. The point is that I want to read them in their original language. For the record, I have since acquired the entire U.K. series in a boxed set from Amazon.co.uk. Agree with tabard. In schools these games bibs are sometimes referrdto as tabards as some think bib babyish. Tabards proper are used as two sided aprons when children are painting so as to protect clothes. Just to drop another word in. My Grandfather came from Middlesbrough and called pinnies brats. The word is obsolete but was used in Lancashire. UK usage for coloured nylon training tops: Bibs, mostly; vests/tabards reasonably often. Pinnies never. A pinny is an apron or some form of light protective garment worn over clothes for cooking/housework. My grandmother always wore a pinny but I doubt the modern career woman would be seen dead in one – it would no doubt be viewed as an obsolete symbol of an oppressive patriarchal society. Having grown up in the south of England, bib, tabard and vest are all familiar terms for the sports equipment. Pinny/pinafore is also a familiar term to me, but mostly from reading – we’d refer to the kitchen protection as an apron! Was this American influence, or have other (thus far silent) people experienced this too? Horse riders wear high visibility tabards for safety, and sometimes with numbers or team colours when competing. Similarly, cyclists and runners. Dinner lady doesn’t mean the same as lunch lady, the staff at the cafeteria who hand out food to the ungrateful little brats? Yep, we call them bibs for 5-a-side football in the Midlands. Pinny is so old fashioned, you usually hear them called aprons these days, you’ll get a more results shopping for an apron than a pinny on google.co.uk/shopping. I’m Canadian and we called them pinnies in high school. They were exactly as you describe: loose mesh shirts we wore over our clothes. “Pinnies” in the US definitely refer to the mesh shirts worn over regular gym kit in order to differentiate between temporary teams selected daily for P.E. However – and this may be a stretch – it may come from the collegiate level. In college, varsity athletes were given “pins”. These were industrial safety pins with our number etched on them to which were attached a shirt, shorts, socks, and jock issued by the equipment manager. At the end of practice, we would secure to our pin whatever was soiled, dump it in a bin, and it would be returned the next day, clean, and hung on a hook with our number on it. We called them “pin” clothes, as in “I haven’t done any laundry weeks, so I am wearing my pin socks to class”. A pinny, from “pinafore”, doesn’t fit over a garment but, quite literally, in front. It was pinned afore. An apron was pinned to the front of a housewife’s dress, so that the dirt, dust, splashes etc from cooking, baking, cleaning, washing, dusting etc would not stain her dress: the pinny could then go into the washing, being very much easier to wash than the heavier, more expensive dress. Apron tended to be a bit upper class; pinny was used by working women (which includes housewives, of course). My mam’s pinnies did not actually pin: they tied round the neck and waist. When I did woodwork and then metalwork at school (nearly 50 yrs ago), I was expected to wear an apron. Men and boys would never refer to such as pinnies, which were exclusively female. Pinny is widely used to describe a top used by boys and girls in athletics in Chester County school sports, according to sportswriters at the Daily Local News in West Chester, Pa. It can be any sport. They mentioned soccer, lacrosse, field hockey, even the shirt worn over a football jersey. They seemed to think I was daft when I asked the question. Once upon a time there was a little girl called Lucie, who lived at a farm called Little-town. She was a good little girl — only she was always losing her pocket-handkerchiefs! One day little Lucie came into the farm-yard crying — oh, she did cry so! “I’ve lost my pocket-handkin! Three pocket-handkins and a pinny! Have you seen them, Tabby Kitten? I being Cantab (Trinity College, 1961-64) was struck that the 6%ers aslo call themselves Cantabs (although I doubt they know the long form is Cantabrigian). I am from the 2% Cambridge University, by the river Cam. Harvard, of course, is not the only university in Cambridge. The etymology of “pinafore”, by the way, is “pinned before”, something that is pinned to the front of your ordinary clothing: hence an apron. Further to the above, a Pinafore was originally a Victorian child’s apron, worn, surprisingly, mainly by boys ( it was customary in mid Victorian England to dress very young boys as girls. The term, as already mentioned, is a combination of “pin” and “afore”. It later crosed over to the girls’ side in terms of popularity, and by the Edwardian period ( 1900 to 1910 ) almost every girl wore one, from the humblist street urchin to Royal princesses, even up to age 18. The fact that the pinafore came to prominence and popularity after our American cousins had decided to go their own way explains why the term pinny is not used in the US to mean apron. As one or two of you have mentioned already, “pinny” is a definitely feminine word, men would never describe their work garment as that. Today, now that aprons in the home have become less and less abundant ( sadly ), today’s youngsters think of “pinny” as an old fashioned term, the sort of wrap around variety you always see that great British character actress, Irene Handl, wearing. In sporting terms (especially football), players wear ‘bibs’ to determine who is on which team. For instance, you can have a team of players wearing bibs (the “bibs”) over their tops playing against a team wearing no bibs at all (“non-bibs”) or, more likely, a team wearing bibs of one all one colour (e.g. the blues) taking on a team wearing bibs of a different colour (e.g. the reds).